A Franco-German family of Orientalists. Their original home was Derenburg, a town near Halberstadt, Saxony, whence they moved successively to Offenbach, Frankfort-on-the-Main, and Mayence. Concerning Jacob Derenburg, the first known member of the family, nothing is ascertainable. 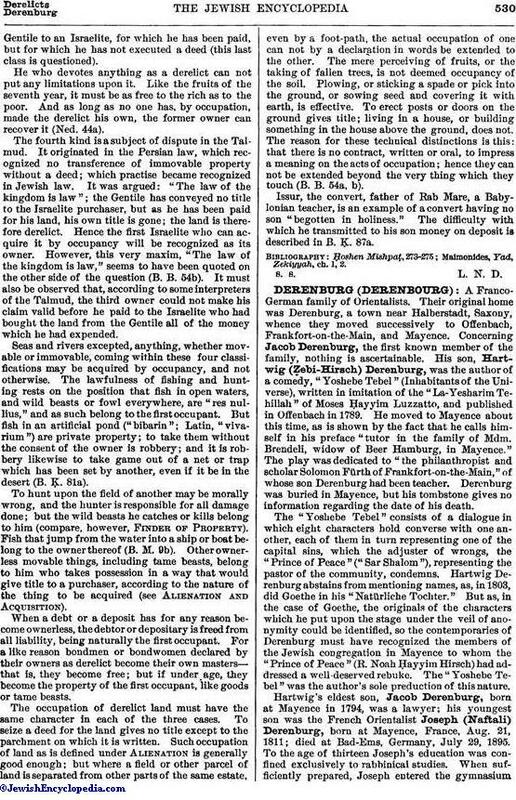 His son, Hartwig (Ẓebi-Hirsch) Derenburg, was the author of a comedy, "Yoshebe Tebel" (Inhabitants of the Universe), written in imitation of the "La-Yesharim Tehillah" of Moses Ḥayyim Luzzatto, and published in Offenbach in 1789. He moved to Mayence about this time, as is shown by the fact that he calls himself in his preface "tutor in the family of Mdm. Brendeli, widow of Beer Hamburg, in Mayence." The play was dedicated to "the philanthropist and scholar Solomon Fürth of Frankfort-on-the-Main," of whose son Derenburg had been teacher. Derenburg was buried in Mayence, but his tombstone gives no information regarding the date of his death. The "Yoshebe Tebel" consists of a dialogue in which eight characters hold converse with one another, each of them in turn representing one of the capital sins, which the adjuster of wrongs, the "Prince of Peace" ("Sar Shalom"), representing the pastor of the community, condemns. Hartwig Derenburg abstains from mentioning names, as, in 1803, did Goethe in his "Natürliche Tochter." But as, in the case of Goethe, the originals of the characters which he put upon the stage under the veil of anonymity could be identified, so the contemporaries of Derenburg must have recognized the members of the Jewish congregation in Mayence to whom the "Prince of Peace" (R. Noah Ḥayyim Hirsch) had addressed a well-deserved rebuke. The "Yoshebe Tebel" was the author's sole preduction of this nature. 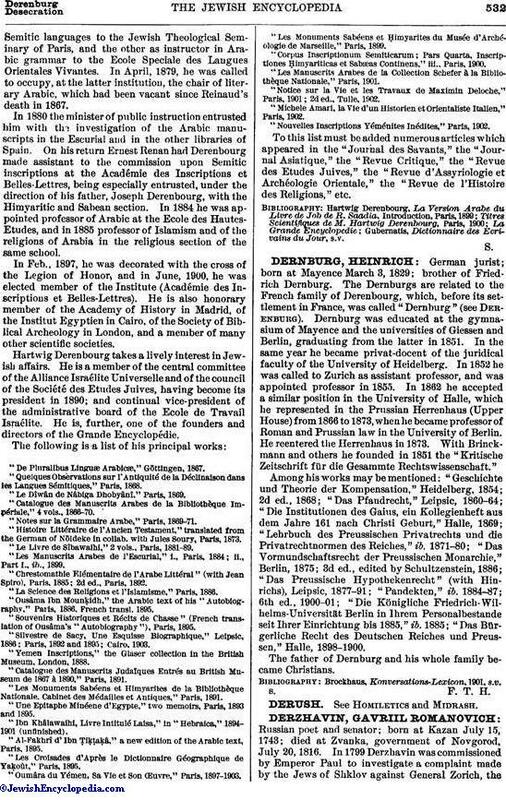 Hartwig's eldest son, Jacob Derenburg, born at Mayence in 1794, was a lawyer; his youngest son was the French Orientalist Joseph (Naftali) Derenburg, born at Mayence, France, Aug. 21, 1811; died at Bad-Ems, Germany, July 29, 1895. To the age of thirteen Joseph's education was confined exclusively to rabbinical studies. When sufficiently prepared, Joseph entered the gymnasiumin Mayence, and then attended lectures in the University of Giessen, and afterward in that of Bonn, where he studied Arabic under Freytag. It was principally due to his intimate friendship with Abraham Geiger that he did not entirely drift into the domain of Semitic philology, but remained faithful to Jewish science. Abandoning the idea of becoming a rabbi, and having obtained his Ph.D. degree, Joseph in 1834 left Bonn for Amsterdam, where he accepted a position as tutor with the Bischoffsheim family. When in 1838 his pupil Raphael Louis Bischoffsheim went to Paris to study at the Ecole Centrale, Joseph accompanied him, and took up his abode in Paris. In 1841 he became associate proprietor of the Pension Coutant, and directed the religious and moral instruction of the Jewish pupils. 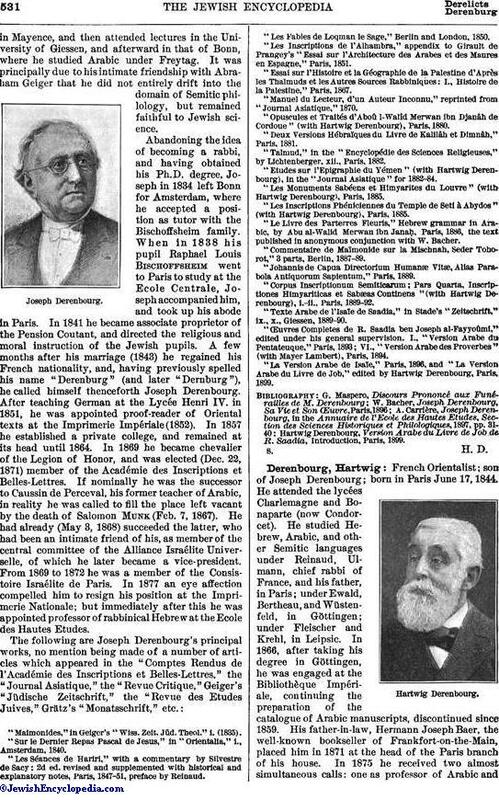 A few months after his marriage (1843) he regained his French nationality, and, having previously spelled his name "Derenburg" (and later "Dernburg"), he called himself thenceforth Joseph Derenbourg. After teaching German at the Lycée Henri IV. in 1851, he was appointed proof-reader of Oriental texts at the Imprimerie Impériale (1852). In 1857 he established a private college, and remained at its head until 1864. In 1869 he became chevalier of the Legion of Honor, and was elected (Dec. 22, 1871) member of the Académie des Inscriptions et Belles-Lettres. If nominally he was the successor to Caussin de Perceval, his former teacher of Arabic, in reality he was called to fill the place left vacant by the death of Salomon Munk (Feb. 7, 1867). He had already (May 3, 1868) succeeded the latter, who had been an intimate friend of his, as member of the central committee of the Alliance Israélite Universelle, of which he later became a vice-president. From 1869 to 1872 he was a member of the Consistoire Israélite de Paris. In 1877 an eye affection compelled him to resign his position at the Imprimerie Nationale; but immediately after this he was appointed professor of rabbinical Hebrew at the Ecole des Hautes Etudes. "Maimonides," in Geiger's "Wiss. Zeit. Jüd. Theol." i. (1835). "Sur le Dernier Repas Pascal de Jesus," in "Orientalia," i., Amsterdam, 1840. "Les Séances de Hariri," with a commentary by Silvestre de Sacy: 2d ed. revised and supplemented with historical and explanatory notes, Paris, 1847-51, preface by Reinaud. "Les Fables de Loqman le Sage," Berlin and London, 1850. "Les Inscriptions de l'Alhambra," appendix to Girault de Prangey's "Essai sur l'Architecture des Arabes et des Maures en Espagne," Paris, 1851. "Essai sur l'Histoire et la Géographie de la Palestine d'Après les Thalmuds et les Autres Sources Rabbiniques: I., Histoire de la Palestine," Paris, 1867. "Manuel du Lecteur, d'un Auteur Inconnu," reprinted from "Journal Asiatique," 1870. "Opuscules et Traités d' Aboû I-Walîd Merwan ibn Djanâh de Cordoue" (with Hartwig Derenbourg), Paris, 1880. "Deux Versions Hébraïques du Livre de Kalilâh et Dimnâh," Paris, 1881. "Talmud," in the "Encyclopédie des Sciences Religieuses," by Lichtenberger, xii., Paris. 1882. "Etudes sur l'Epigraphie du Yémen "(with Hartwig Derenbourg), in the "Journal Asiatique" for 1882-84. "Les Monuments Sabéens et Himyarites du Louvre" (with Hartwig Derenbourg), Paris, 1885. "Les inscriptions Phéniciennes du Temple de Seti à Abydos" (with Hartwig Derenbourg), Paris, 1885. "Le Livre des Parterres Fleuris," Hebrew grammar in Arabic, by Abu al-Walid Merwan ibn Janaḥ, Paris, 1886, the text published in anonymous conjunction with W. Bacher. "Commentaire de Maïmonide sur la Mischnah, Seder Tohorot," 3 parts, Berlin, 1887-89. "Johannis de Capua Directorium Humanæ Vitæ, Alias Parabola Antiquorum Sapientum," Paris, 1889. "Corpus Inscriptionum Semiticarum; Pars Quarta, Inscriptiones Himyariticas et Sabæas Continens" (with Hartwig Derenbourg), i.-ii., Paris, 1889-92. "Texte Arabe de l'Isaïe de Saadia," in Stade's "Zeitschrift," ix., x., Giessen, 1889-90. "Œuvres Completes de R. Saadia ben Joseph al-Fayyoûmi," edited under his general supervision. I., "Version Arabe du Pentateuque," Paris, 1893; VI., "Version Arabe des Proverbes" (with Mayer Lambert), Paris, 1894. "La Version Arabe de Isaïe," Paris, 1896, and "La Version Arabe du Livre de Job," edited by Hartwig Derenbourg, Paris, 1899. Hartwig Derenbourg, Version Arabe du Livre de Job de R. Saadia, Introduction, Paris, 1899. French Orientalist; son of Joseph Derenbourg; born in Paris June 17, 1844. He attended the lycées Charlemagne and Bonaparte (now Condorcet). He studied Hebrew, Arabic, and other Semitic languages under Reinaud, Ulmann, chief rabbi of France, and his father, in Paris; under Ewald, Bertheau, and Wüstenfeld, in Göttingen; under Fleischer and Krehl., in Leipsic. In 1866, after taking his degree in Göttingen, he was engaged at the Bibliothèque Impériale, continuing the preparation of the catalogue of Arabic manuscripts, discontinued since 1859. His father-in-law, Hermann Joseph Baer, the well-known bookseller of Frankfort-on-the-Main, placed him in 1871 at the head of the Paris branch of his house. In 1875 he received two almost simultaneous calls: one as professor of Arabic andSemitic languages to the Jewish Theological Seminary of Paris, and the other as instructor in Arabic grammar to the Ecole Speciale des Langues Orientales Vivantes. In April, 1879, he was called to occupy, at the latter institution, the chair of literary Arabic, which had been vacant since Reinaud's death in 1867. In 1880 the minister of public instruction entrusted him with the investigation of the Arabic manuscripts in the Escurial and in the other libraries of Spain. On his return Earnest Renan had Derenbourg made assistant to the commission upon Semitic inscriptions at the Académie des Inscriptions et Belles-Lettres, being especially entrusted, under the direction of his father, Joseph Derenbourg, with the Himyaritic and Sabean section. In 1884 he was appointed professor of Arabic at the Ecole des Hautes-Etudes, and in 1885 professor of Islamism and of the religions of Arabia in the religious section of the same school. In Feb., 1897, he was decorated with the cross of the Legion of Honor, and in June, 1900, he was elected member of the Institute (Académie des Inscriptions et Belles-Lettres). He is also honorary member of the Academy of History in Madrid, of the Institut Egyptien in Cairo of the Society of Biblical Archeology in London, and a member of many other scientific societies. Hartwig Derenbourg takes a lively interest in Jewish affairs. He is a member of the central committee of the Alliance Israélite Universelle and of the council of the Société des Etudes Juives, having become its president in 1890; and continual vice-president of the administrative board of the Ecole de Travail Israélite. He is, further, one of the founders and directors of the Grande Encyclopédie. "De Pluralibus Linguæ Arabicæ," Göttingen, 1867. "Quelques Obsèrvations sur l'Antiquitè de la Dèclinaison dans les Langues Sèmitiques," Paris, 1868. "Le Dîwân de Nâbiga Dhobyânî," Paris, 1869. "Catalogue des Manuscrits Arabes de la Bibliothèque Impèriale," 4 vols., 1866-70. "Notes sur la Grammaire Arabe," Paris, 1869-71. "Histoire Littèraire de l'Ancien Testament," translated from the German of Nöldeke in collab. with Jules Soury, Paris, 1873. "Le Livre de Sîbawaihi," 2 vols., Paris, 1881-89. "Les Manuscrits Arabes de l'Escurial," i., Paris, 1884; ii., Part I., ib., 1899. "Chrestomathie Elémentaire de l'Arabe Littéral" (with Jean Spiro), Paris, 1885; 2d ed., Paris, 1892. "La Science des Religions et l'Islamisme," Paris, 1886. "Ousâma Ibn Mounḳidh," the Arabic text of his "Autobiography," Paris, 1886, French transl. 1895. "Souvenirs Historiques et Récits de Chasse" (French translation of Ousâma's "Autobiography"), Paris, 1895. "Silvestre de Sacy, Une Esquisse Biographique," Leipsic, 1886; Paris, 1892 and 1895; Cairo. 1903. "Yemen Inscriptions," the Glaser collection in the British Museum, London, 1888. "Catalogue des Manuscrits Judaïques Entrés au British Museum de 1867 à 1890," Paris, 1891. "Les Monuments Sabéens et Himyarites de la Bibliothèque Nationale. Cabinet des Médailles et Antiques," Paris, 1891. "Une Epitaphe Minéene d'Egypte," two memoirs, Paris, 1893 and 1895. "Ibn Khâlawaihi, Livre Intitulâ Laisa," in "Hebraica," 1894-1901 (unfinished). "Al-Fakhrî d' Ibn Ṭiḳaḳâ, a new edition of the Arabic text, Paris, 1895. "Les Croisades d'Après le Dictionnaire Géographique de Yaḳoût," Paris, 1895. "Oumâra du Yémen, Sa Vie et Son Œuvre," Paris, 1897-1903. "Les Monuments Sabéens et Ḥimyarites du Musée d'Archéologie de Marseille," Paris, 1899. Corpus Inscriptionum Semiticarum; Pars Quarta, Inscriptiones Ḥimyariticas et Sabæas Continens," iii., Paris, 1900. "Les Manuscrits Arabes de la Collection Schefer à la Bibliothèque Nationale," Paris, 1901. "Notice sur la Vie et les Travaux de Maximin Deloche," Paris, 1901; 2d ed., Tulle, 1902. "Michele Amari, la Vie d'un Historien et Orientaliste Italien," Paris, 1902. "Nouvelles Inscriptions Yéménites Inédites," Paris, 1902. To this list must be added numerous articles which appeared in the "Journal des Savants," the "Journal Asiatique," the "Revue Critique," the "Revue des Etudes Juives," the "Revue d'Assyriologie et Archéologie Orientale," the "Revue de l'Histoire des Religions," etc. Gubernatis, Dictionnaire des Ecrivains du Jour, s.v.